On Wednesday, U.S. men’s national team coach Bruce Arena announced the roster for the USMNT’s upcoming World Cup qualifiers against Honduras and Panama. There were no huge surprises, except maybe for the inclusion of Clint Dempsey, who recently returned to soccer after being sidelined with an unspecified heart condition. Wonderteen-on-a-hot-streak Christian Pulisic will get the chance to prove himself further; old man DaMarcus Beasley is still hanging around, despite his attempt to retire; MLS journeyman Dax McCarty is getting another shot on the national squad after being eschewed for years by Jurgen Klinsmann; and the team’s stalwart trio of goalkeepers—Tim Howard, Brad Guzan, and Nick Rimando—are back. Howard, Guzan, and Rimando certainly have the most international experience out of the available U.S. goalies, though that’s mostly because they’re 38, 32, and 37, respectively. While erstwhile U.S. keepers Kasey Keller and Brad Friedel played for the national team well into their 30s, they were also still regularly playing for European club teams in those years. In contrast, Howard, newly returned from a four-month injury layoff, plays for the Colorado Rapids; Guzan, who has barely played at Middlesborough as of late, will move to Atlanta FC this summer; and Rimando, usually the USMNT’s third keeper, starts for Real Salt Lake. Are three aging MLS-caliber keepers the best U.S. soccer has to offer for two crucial qualifying games? Maybe! Probably! But there are other younger, largely untested internationally, alternatives out there, too, and it’s conservative to the point of foolishness not to even include any of them on the roster. The importance of these World Cup qualifying games can’t be overstated, and, yes, you want an experienced goalie between the posts. But they’re important because they’ll—hopefully—get the USMNT to the 2018 World Cup. 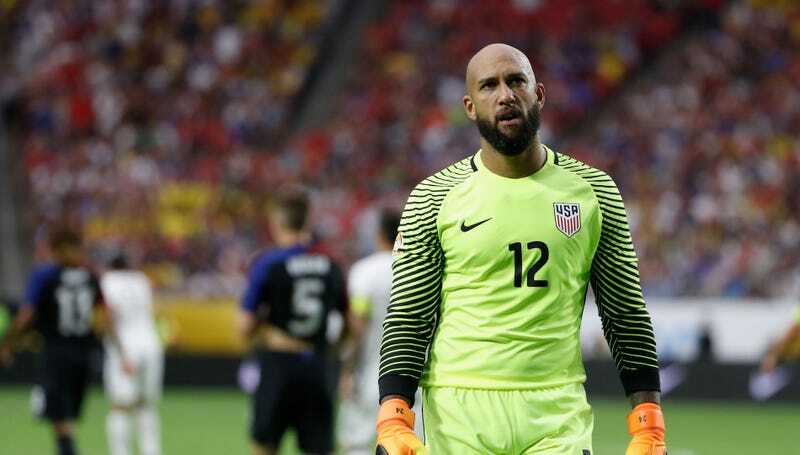 If the U.S. gets there and the options for keeper are an overripe Tim Howard or an inexperienced twenty-something, just having made it to Russia won’t matter too much. It’s low risk to stick a young keeper on the bench at this phase in qualifying, to start preparing him for the big stage. So who are these young alternatives? First, there’s 21-year-old Ethan Horvath, the backup keeper for the Belgian club Brugge, who earned one cap with the USMNT in a 2-0 friendly win over Cuba in October. He was also on the U.S. roster for last November’s round of World Cup qualifying. Before Brugge, Horvath started for the Norwegian club Molde, helping them to a Champions League berth in the 2015-16 season. Next up is William Yarbrough, the 27-year-old starting keeper for Liga MX’s León. Klinsmann named him to the last World Cup qualifying roster, too, though he didn’t see any minutes. There’s also 21-year-old Zack Steffan, who plays for Columbus Crew, and D.C. United’s 26-year-old keeper Bill Hamid, who hurt his knee in the USMNT’s January training camp, but could still become the United States’ next go-to goalie. For the USMNT January training camp, Arena invited four goalkeepers, not counting the injured Hamid: Rimando, Brian Rowe (LA Galaxy), Luis Robles (New York Red Bull), and David Bingham (San Jose Earthquakes). Bingham and Robles, along with Rimando, were then included on the roster for the USMNT’s friendlies against Serbia and Jamaica in late January and early February. Horvath and Yarbrough didn’t figure in, as both the camp and friendlies were restricted to MLSers. When it came time to name the final roster for these qualifiers, though, Arena went with the old and—given the importance of these two games—hopefully the faithful. But even if the USMNT manages to propel itself out of dead last in this round of qualifying, Arena’s roster choice is uninspiring. In 2018, the U.S. will need much better than Howard, Rimando, or Guzan in goal. Might as well start trying to find who that is right now.